For the better part of four decades, a wild-born African elephant named Mila lived alone in New Zealand, denied companionship in her captivity. 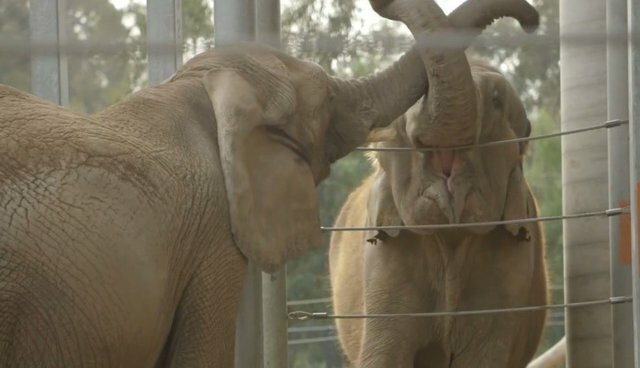 After being held for more than 30 years as a circus's lone elephant, Mila was eventually transferred to an Auckland zoo where she continued to spend the last few years by herself. But now, after her keepers there spearheaded a campaign to end her years of isolation, one of the world's loneliest elephants has finally been reunited with her own kind. Not long after Mila arrived to the Franklin Zoo from the circus, her caregiver there, Helen Schofield, began working to see the elephant sent abroad to another facility that would provide her with some much needed socialization among others like her. Sadly, in 2012, an accident involving Mila left Schofield dead - but her colleagues took up her mission to move the elephant to a better life. Zoo staff and supporters eventually raised $1.5 million to pay for Mila's relocation to the San Diego Zoo, home to six other African and Asian elephants. After spending several months in quarantine following the long flight to California, Mila was recently introduced to the zoo's matriarch elephant, Mary - the first animal like her Mila had seen since she was four years old.